Multibeam data collected on an underwater wreck found in the Gulf of Mexico. Coast Survey's Automated Wreck and Obstruction Information System (AWOIS) contains information on over 10,000 submerged wrecks and obstructions in the coastal waters of the United States. Information includes latitude and longitude of each feature along with brief historic and descriptive details. 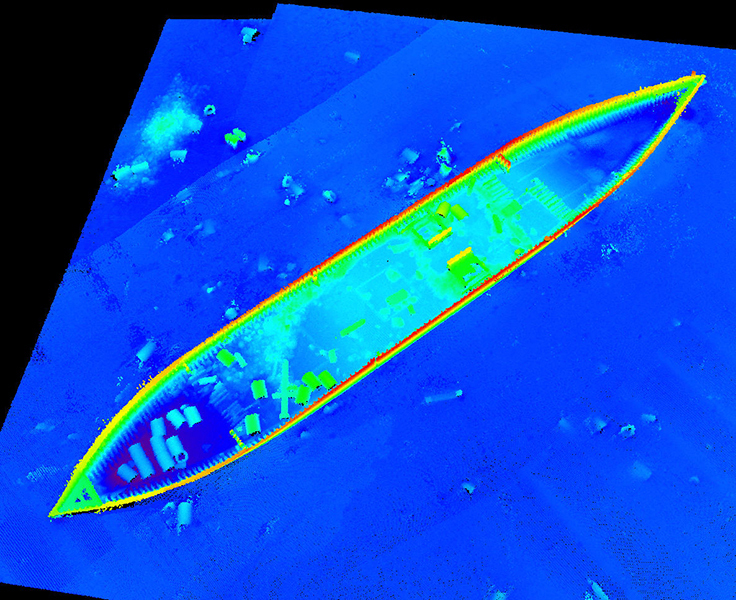 In addition to its use in planning hydrographic surveys, AWOIS is a valuable tool and information source for marine archaeologists and historians, fishermen, divers, salvage operators, and others in the marine community. Once you download an AWOIS file, you can open that file directly in a mapping application, such as Google Earth or Google Maps. You can then navigate directly to your area of interest and obtain information about individual features. Clicking on any AWOIS item will bring up additional information, such as feature type, position, and history. AWOIS records are not comprehensive. There are wrecks in AWOIS that do not appear on the nautical chart and wrecks on the nautical chart that do not appear in AWOIS. In 2016 the Office of Coast Survey stopped updating the AWOIS database. Reported wrecks that have been salvaged or disproved by further investigation are not included in AWOIS. These data are not for navigation.